What is it with chocolate and Valentine’s Day that makes them feel indispensible, one from the other? In the other room, the synthesized music of Mew floats into this room, over to my desk as a knife chops applewood smoked bacon for a once a year gift of homemade Carbonara. It’s become our tradition of a simple decadent dish anticipated with the fervor of turkey and dressing or any dish you might assign to a holiday. 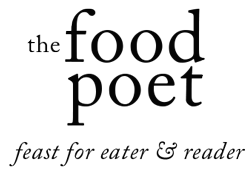 Soon, a sizzle and the wooden spoon’s nudging against the stainless steel walls will join the happy sounds coming forth from our kitchen. Then too, more chopping will commence, but a harder sound, as if knuckles rap against the front door. Twirling my fork around the noodles, watching John Cusack become Edgar Allen Poe on screen and sidled up against my love, this, this is worth remembering. And we try to etch the small moments into the trunk of our memories. What is it with our need to complicate the very best things in life? We chase happiness like it just might be joy but that goodness can’t last. Joy, on the other hand, never ceases to surprise me. How can something so good be found in the dregs of circumstance? And maybe that’s it. Circumstance proves happiness to be so very fickle, where it cannot touch joy. Other times, we have to scratch around the dry earth of our spirits for that joy, but that does not vanquish it from existing. I think of Corrie ten Boom, a personal hero of mine who somehow found bits of joy even as she was incarcerated in a concentration camp for hiding Jews in her house during World War II or Paul singing songs in prison. When you come down to it, joy can be hard to understand. If history has shown me anything, we don’t often chase after what we don’t understand. Instead, we try to quell it. Happiness and joy- which one are you running toward or trying to cultivate? And this is why, after a day dedicated to chocolate and the kind of love found in small gestures or the grandiose, we come back to joy. 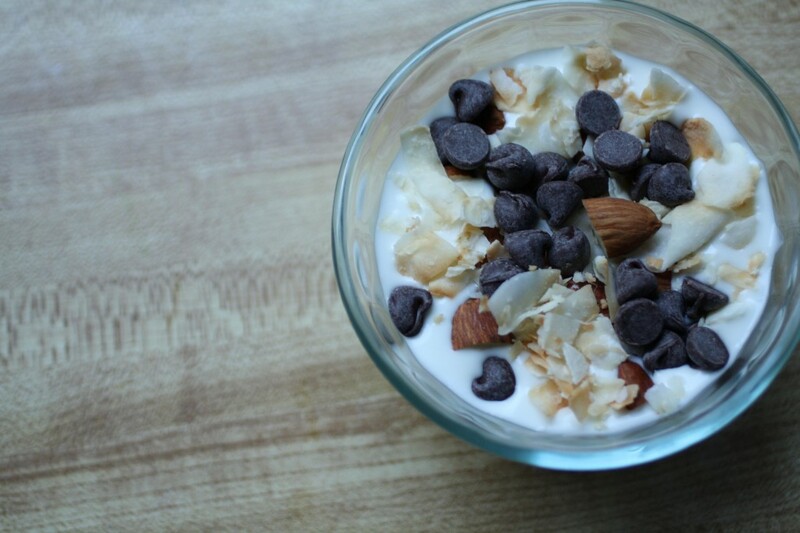 It’s no surprise that the classic combination of almonds, coconuts and chocolate culminate in nomenclature of joy. Just as I think you will agree these Creamy Coconut Joys can present a small luscious gift whenever the occasion calls for it. Stumbling over the ridiculously luscious St. Benoit yogurt had me clamoring for resuming my post-dinner yogurt habit. Since I trust the folks in Sonoma to not steer me wrong with yogurt, we go full fat and I’ve been told by an RD friend that yogurt from grassfed cows can give more omega’s, which is a bonus to the creamy consistency of our other favorites, Straus Organic or our love of goat’s milk yogurt from Redwood Hill Farm. Keep in mind, light yogurt equals more processing and really, when you’re keeping it simple, quality ingredients are paramount. You might find these Creamy Coconut Joys live up to their name. We all need a bit more joy in our lives, methinks. This recipe comes together pretty easily. 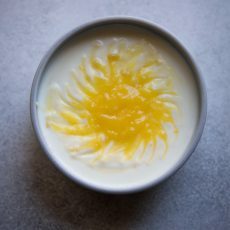 I enjoyed this regularly without the coconut milk, so you can opt for that or take it over the top and make your own coconut cow’s milk yogurt. It’s your choice really. Make the yogurt hours in advance of serving and let it sit in the fridge so the flavors can coalesce. You can also toast the coconut in advance too. 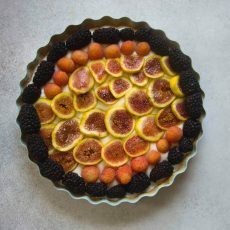 I find this makes for a novel, portable dessert for intimate potlucks as all items get packed into jars and are easy to transport by bus or walking. In a medium sized bowl, empty contents of one quart of yogurt. Spoon coconut milk into the yogurt and stir. Cover and refrigerate. In a pan or electric oven, toast the coconut for around 2:30 to 3 minutes on low medium heat until it starts browning but before it burns. Set aside to cool. In the same pan or electric oven, toast the chopped almonds until they start giving off their aroma and before they burn, around 2:30 to 3 minutes. Set aside to cool. When you’re ready to assemble the Creamy Coconut Joys, pour about 1/2 cup of the coconut yogurt into a small bowl. 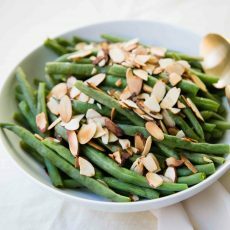 Scatter a tablespoon of almonds on top. Then, sprinkle a tablespoon of the toasted coconut. Lastly, dot the surface of the Joys with a tablespoon of chocolate chips or chunks. You always make me think and you always make me think a little bit outside the box – how interesting to combine the yogurt and coconut milk. My son is a coconut lover and I bet he would devour this! Thanks Beth. I’m glad to hear it and appreciate your kind words.